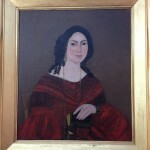 In the early 1990s I acquired an oil portrait of a woman that was painted in 1840 by an artist named E. Sexton. The painting is 28 inches by 24 inches and is framed in gold. Gertrude ****, regal and beautiful in her flowing, scoop-necked, ruby red velvet-like dress, appears to be in her early thirties. She has an oval face with a milky complexion and a pinkish hue about her cheeks. Her nose is straight and compliments her face, and her eyes are dark and almond shaped. Her eyebrows are manicured. Of note, there are slight upturns at the corners of Gertrude’s mouth that give her a Mona Lisa-like expression. Her black hair is shoulder length with soft spiral curls that cascade down her neck. Gertrude was a beautiful woman. In her left hand she is holding a small but thick book of hymns and psalms of the Reformed Dutch Church in North America. The cover has her name imprinted on it in small gold block letters. I have the hymnal and find it interesting that the name in the painting is upside down from that of the book. I suspect artist license is the reason for the change. As for jewelry, there are dangling gold earrings and a locket on a long gold chain. The locket is tucked under the bodice of her dress. Only the four fingers of her left hand are represented in the painting, and two of them hold four gold rings. On the index finger are diamond and signet rings. On the middle finger are an emerald and a gold band. At the time, I had a weight bench in a corner of my basement on which I kept a heavy barbell. A few days after Gertrude entered my life, I went to my basement intending to work out. I found that the weight bench with the barbell had been turned 180º. The new position caused it to be jammed against a cement wall and made using it impossible. I assumed that my wife Pauline had moved it. When I asked her why she had done it, she denied moving the weight bench and reminded me that the apparatus was far too heavy for her to manipulate. Although I had no reason to move it and didn’t recall doing it, I assumed I must have absentmindedly moved the weight bench and simply forgot doing it. Two nights later Pauline and I were sleeping. It was just after 3 a.m. As I turned toward my wife, I was wakened by movement. I opened my eyes and saw who I thought was Pauline sit up and get out of our bed. I had a mental image of her wearing a white diaphanous nightgown that I hadn’t seen before. At the time, I gave the thought no significance. I assumed she was going to the bathroom. In my half-awake state my hand reached over to her side of the bed. To my surprise, Pauline was there. I woke her and asked if she had been out of bed in the last few minutes. She hadn’t. My mind was reeling. I was positive I’d seen a woman who had been lying next to me sit up and leave my bed. It wasn’t my wife, so who was it? Had I dreamed or a hallucinated the incident? It seemed very real to me. As with the movement of the weight bench, I was forced to cope with another unexplained event. Less than a week passed, and, again, I was sleeping in my bed. Since the incident with the mysterious woman, my sleep had been troubled. I began to wake and open my eyes several times a night. At one point I turned toward the outside of the bed and opened my eyes. Standing before me was the woman in the white diaphanous gown. I sprang to a sitting position, my hands positioned behind me for support. There was no doubt I was awake. I sat on the edge of my bed, and the figure glided back slightly but remained a few feet from me. I was not dreaming or hallucinating. I stood. The apparition remained in place for several seconds before slowly floating backward and upward until she vanished near the ceiling. I assure you I am a man grounded in science. As a hobby, I study astronomy and quantum theory. Logical reasoning is my strong point. I didn’t believe in ghosts, but to my disbelief, I had seen one. She was Gertrude, the woman whose portrait hung on my wall. During that time, the most mind-blowing of all the things that happened was a recurring dream I had. In the dream, two people’s names came to me as if I was hearing them in an echo chamber, and I’d wake up repeating them. One thing was certain. Gertrude had given me the names. Part II of my story of Gertrude will reveal more strange occurrences and the significance of the names I had been given.